Posted by admin in Alaska, eruptions, NASA Earth Observatory, natural hazards, Redoubt, United States. At the NASA Earth Observatory, the Image of the Day for 9 April 2009 is very timely: lahars from Mount Redoubt near – or, to be more precise, all around – the Drift River Oil Terminal (small version above). The image was captured on 4 April 2009 by the Advanced Land Imager (ALI) on NASA’s Earth Observing-1 satellite. The detail view below, taken from the full-size image (4200 x 6500 pixels, 5MB), shows a close-up of the terminal, surrounded by brown volcanic mudflows that have descended the Drift River valley. 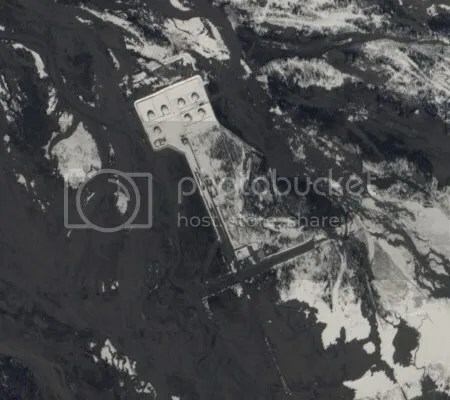 The dyke around the storage tanks has largely kept the lahars at bay and the tanks themselves remain secure, but installations beyond the defences such as the airstrip (lower part of the image) have been covered by volcanic deposits. 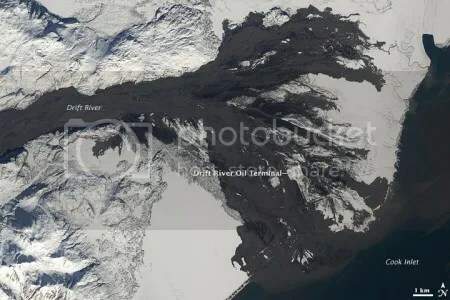 The Drift River image comes with a detailed and informative caption by Michon Scott, and the NASA Earth Observatory team have been kind enough to credit this blog as a source of information, which is always appreciated. NASA Earth Observatory: Lahars near the Drift River Oil Terminal (9 April 2009).